From right: Dr. Nnenna Yakalu, representing the National Health Insurance Scheme; Peter Oshaji, HP+; Dr. Ahmed Danfulani, FCT Health Insurance Scheme; Adamu Bappah, FCT Secretary of Health and Human Services; and officials from the FCT Administration at the HP+-sponsored stakeholders’ meeting in Abuja. Photo by HP+. 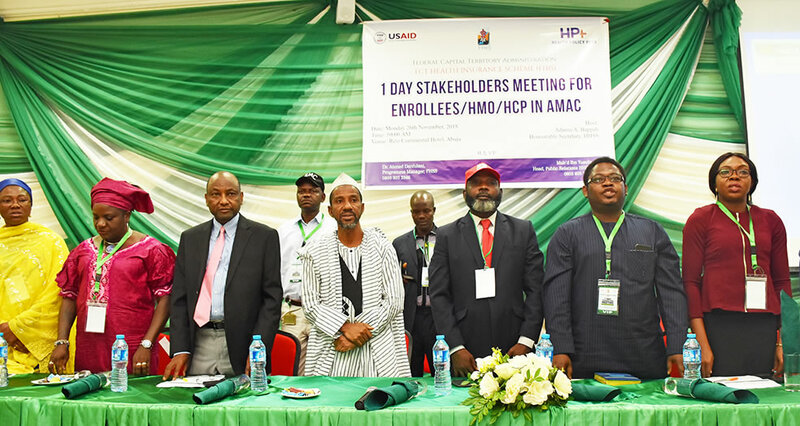 Late in 2018, Nigeria’s Federal Capital Territory (FCT) Health Insurance Scheme broke new ground, holding its first ever stakeholders’ meeting—a move which led to the eventual release of nearly US$1.4 million in stalled funds and new political commitments by some of the FCT’s top leaders. In November, healthcare providers, beneficiaries, and civil society and health maintenance organization representatives gathered to examine the implementation of the health insurance scheme since its roll-out in 2011. They also aimed to generate lessons to improve the scheme’s implementation, thereby providing greater access to high-quality healthcare for the FCT’s estimated 2.2 million people. In the lead-up to the meeting, co-organizers Health Policy Plus (HP+) and the FCT Health Insurance Scheme, took steps to ensure broad participation. The two held community sensitization events to mobilize citizens, ensured adequate representation from the informal sector, and reached out to private sector health providers and health maintenance organizations to discuss financial, management, and technological challenges. Deploy information communication technology to enhance transparency. Expand population coverage to avoid a small pool and ensure sustainability. Solicit the continuous support of the FCT Minister, Secretary of Health and Human Services Secretariat, and Director of Treasury to ensure the prompt release of funds to the agency so it can carry out its projects. for achieving wider health coverage in the FCT. Photo by HP+. Three days after the meeting took place, the FCT Director of Treasury released 350 million Naira (US$972,000) for payment of outstanding capitation to healthcare providers. The original request had been made six months prior. Also, 150 million Naira (US$417,000) was approved by the FCT Minister for fee-for-service payments owed to providers since 2017. The government also committed to settling all remaining overdue payments by the end of 2018 and paying all first quarter 2019 payments in advance. HP+ Nigeria and its partners are hard at work monitoring the progress of these commitments. Going forward, HP+ will continue to build on the efforts it began in 2018, working with the health insurance scheme to improve its Legislative and Governance Framework and move FCT health insurance legislation through the National Assembly. 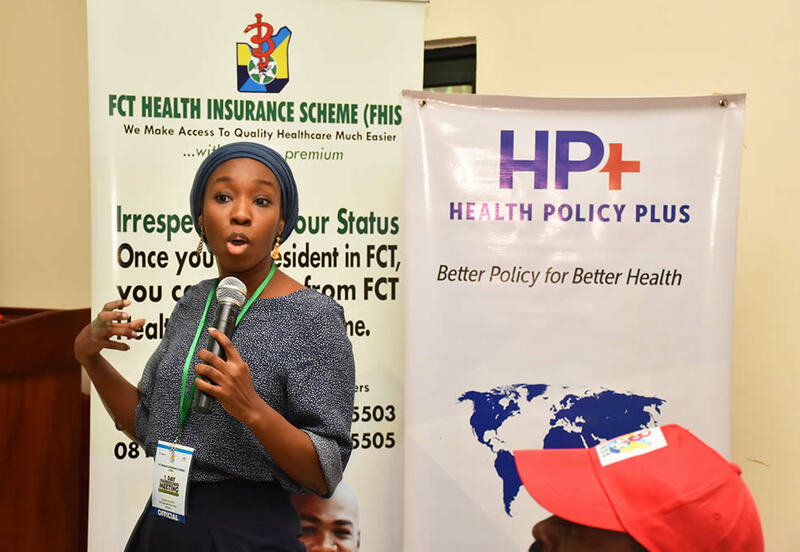 HP+ is also supporting the FCT Health Insurance Scheme to access funds from the Basic Health Care Provision Fund, develop strategies for enrolling informal sector beneficiaries, and strengthen information communication technologies and the management of claims. One part of this support is the development of a demand-generation strategy targeting the informal sector and area councils. Inclusion of area council staff, who are 17,000 strong, could increase the scheme’s premium paying enrollees by 85%, enlarging the overall pool and providing high-quality healthcare for more FCT residents.